Five acres of the farm are intensely cultivated, of which two are blueberries, plus small apple and pear orchards. The remainder of the land is hardwood forest with a stream on the SW boundary. Positioned on a hill facing southward, the three acres of cultivated rows are grouped in eight terraces, 4-6 rows in each, 250-300 feet long. The farm currently has three growing seasons, excluding winter crops which could be included. Interest in livestock/chickens could be considered. Minimal housing is potentially available. 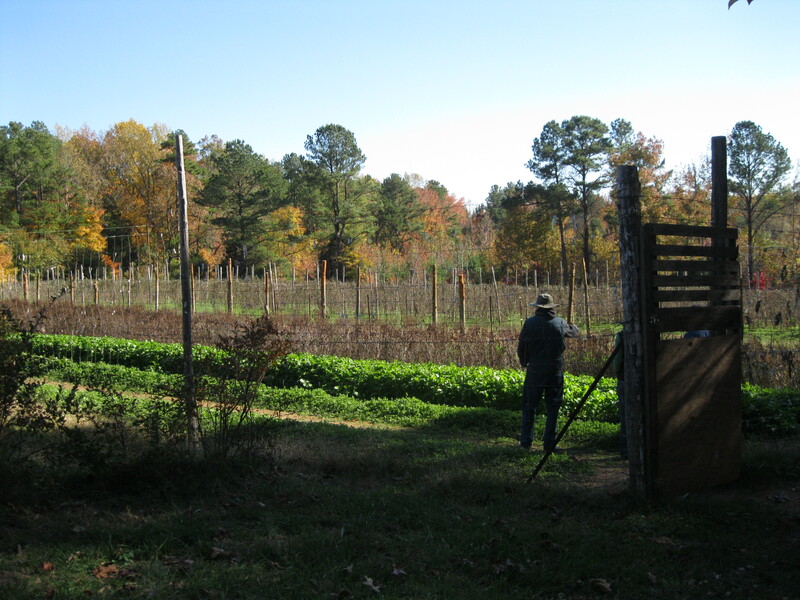 Bill Dow started growing crops organically in 1982, making Ayrshire the first certified organic farm in North Carolina. Although it is not currently certified, it has been consistently managed according to organic standards throughout the years. Dow recently obtained a conservation easement through Triangle Land Conservancy, barring subdivision and thus assuring a secure future for his farm land. For many years, Dow has sold his produce to restaurants in the Triangle area as well as weekly at the Carrboro Farmers Market, one of the largest in the Southeast and one he helped start around 1985. The farm has traditionally been open to tours and special events. It has served as a lab for many individuals interested in learning about agriculture, some of whom have been students in the outstanding Sustainable Agriculture program at the nearby community college in Pittsboro. If you might be interested in leasing a parcel of (or all of) the five acres for cultivation, please contact Bill Dow at dfwalker99@hotmail.com. A personal interview may be requested. Prospective farmers will need to do some initial planting before March 1, 2011 for spring crops. Dow will be available for limited consulting. For further questions, please contact Bill Dow at dfwalker99@hotmail.com. And find Ayrshire Farm on Facebook! as well as rows for planting, and soil has been enriched organically since 1983.